Final update on the Duty, Honor, Planet free book promotion. Just a note to let everyone know that the final tally on the five day free book promotion for Duty, Honor, Planet was right around 2700 downloads. Here’s hoping some of those people like the book enough to check out the sequels. Duty Honor Planet, one day into the 5-day giveaway, has hit 1063 books given away and is currently #190 in the free kindle books and #1 in military SF on Kindle. New cover for Honor Bound. So, I had enough credits left on iStockPhoto to download one more illustration and I found one that I felt captured the feel that the second book in the Duty, Honor, Planet trilogy, Honor Bound, takes place more in space than the other two books. The bad news is, I am increasing the prices of some of my books. Honor Bound is now $2.99 and The Line of Duty is $3.99. I have also increased the price of the collection to $6.99 to reflect those price increases. 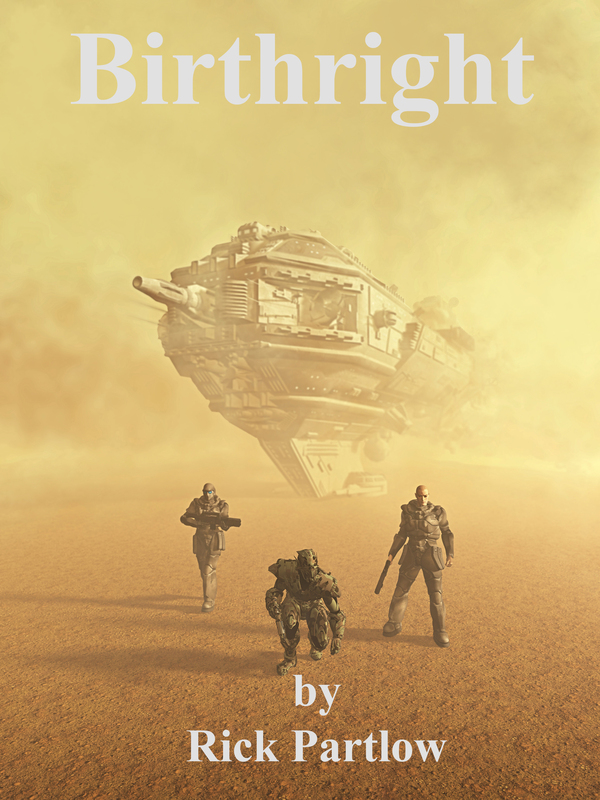 As for the good news…well, I have gone with a new cover for Birthright’s Kindle edition, for one. No, seriously, if you like this book, please tell your friends and even your enemies that they can download it free all next week. I was just thinking the other day that the main characters for both my Duty, Honor, Planet series and my Birthright novel (working on a sequel to it now) came from ideas that I first had as a sophomore in college 25 years ago. The main characters—Jason McKay (he was originally Ryker McKay btw) and Shannon Stark from Duty Honor Planet, and Caleb Mitchell and Deke Conner from Birthright—were children of the late 80s, who matured and had their rough edges worn off through the mid 90s as I wrote and rewrote, edited and re-edited the two books. Now Jason and the rest of the characters in the Duty, Honor, Planet series have evolved even further in the intervening years since I wrote two more sequels to that work, but Caleb Mitchell is still a very interesting character. Sometimes, I look at the partial novels that litter my hard drive in scattered segments of 20, 30, 50 or 100 pages and read through them. Some of them are very good ideas, but none of the protagonists seem to call to me to write about them the way Jason and Shannon, Caleb and Deke and the others from those two series do. Since I’m apparently narcissistic enough to believe that people want to read my fiction, I decided that, if I’m serious about writing I should have a writer’s blog. Hopefully I have enough people interested in my fiction that someone will discover and read this. 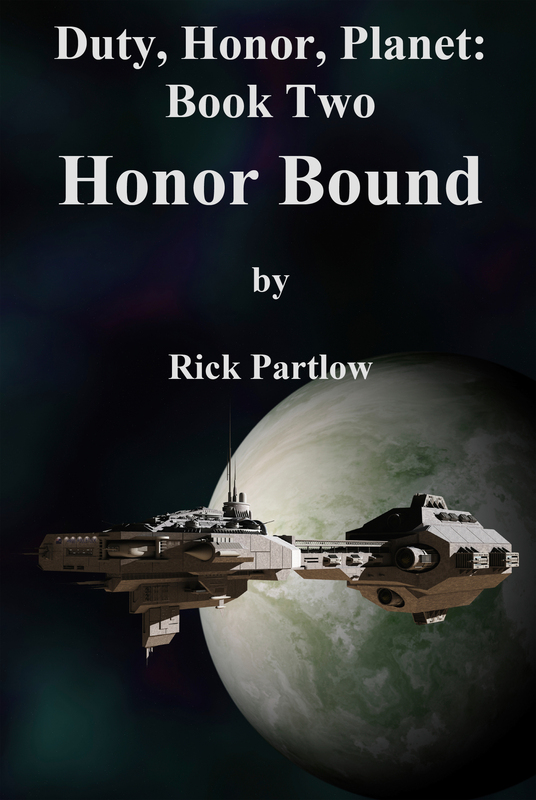 The first book, Duty, Honor, Planet, is the story of Jason McKay, Platoon Leader for a Fleet Marine Reaction Force platoon on a starship who is recruited (after a disastrous mission that, through no fault of his own, leaves 8 of his men dead) by the head of Spacefleet Intelligence to be the leader of a new, experimental special forces group. Earth is united under a government called The Republic, brought together by the United States, Canada, Australia and western Europe after a cataclysmic nuclear war between China and a resurgent Russian Protectorate under their charismatic military dictator General Sergei Antonov. (I wrote this plot long before Putin came to power btw). The war happens around the last quarter of the 21st century, while Russia and China are in a space race to see who can exploit the mineral resources of the asteroid belt first. Russia is winning the race and has had three different missions to the Belt before the war breaks out, but the war devastates much of Russia and China and kills billions worldwide due to radiation, panic, economic collapse and would-be warlords fighting for territory. When the US President takes control, he does it somewhat brutally, but at that point the survivors are ready for a little brutality to bring order to the chaos. After a few decades of feverish construction and research, several breakthroughs are made technologically. First, fusion energy is harnessed and then a physicist named Adam Eysselink develops a faster-than-light drive that uses newly-harnessed gravimetic fields to manipulate the fabric of spacetime to propel the ships. To run the business of the worldwide reconstruction, the various surviving large corporations are put under a government umbrella, still run privately but given exemption from national tariffs and anti-monopoly laws and organized into the Executive Council of the Multilateral Corporate Interests, known colloquially as the Multicorps. The Multicorps have their own private interests, but they receive government subsidies and/or tax exemptions for off-world construction and production, so it’s in their interest politically to make use of this new Eysselink star drive to open up human colonies on habitable planets of other stars. They sell this as humanity “leaving the cradle,” making our species safe from another potentially world-ending war. The Developing Nations also appreciate the colonies and the subsidized transportation to them, as it allows them to get rid of their troublemakers—they are packed into hibernation on “colony ships” and dumped on barely-developed and sometimes barely habitable worlds to be cheap labor for the Multicorps. This leads to violence on the colonies as well as violence in the Developing Nations, and from this is formed the branches of the Republic military: The Spacefleet, responsible for security in the solar system and in the colonies with a handful of military star cruisers; the Fleet Marine Corps, organized into Reaction Force platoons on each of the cruisers, they are the cavalry that comes in when trouble starts in the colonies; and the Colonial Guard Corps. The CeeGee’s, as they become known, are stationed in armories in every major city in the star colonies and are tasked with keeping order. Their ranks are drawn mostly from the Developing Nations and their officers are from the children of important business and political leaders in those nations. In other words, it’s a giant powderkeg just waiting for a match. Then ships—automated cargo ships and worse, colony ships—start disappearing and turning up (if they turn up at all) with drives, fuel and, more ominously, their passengers and crew missing. After this goes on for a few years, the legendary leader of Fleet Intelligence, Kenneth Mellanby, “the Snake,” decides that there is an unknown enemy out there and he wants to be prepared for it. He decides to form the first special operations unit in a century and he chooses 1st LT Jason McKay to lead it. The core of this new unit, those meant to later train the trainers, are 2nd LT Shannon Stark, an Intelligence wunderkind with test scores off the charts and a ruthless edge to her; Fleet Marines NCOs Sergeants Vincent Mahoney and Jock Gregory, best friends since basic training who have outstanding records and combat experience; and Technician Second Class Tom Crossman, a Fleet Security enlisted man with a smart mouth, a cavalier attitude, a jacket full of discipline problems…and an IQ of 160, as well as an incredible natural ability at unarmed combat. To give this motley crew a chance to work together, Colonel Mellanby assigns them as security for protecting Valerie O’Keefe, daughter of an important Senator and leading crusader for an emigrants’ rights organization that lobbies for the rights of the forced exiles who are taken to the colonies as cheap labor for the Multicorps. She and her fiancé, Glen Mulrooney, the Senator’s chief aide, are being taken on a tour of the colonies on a military cruiser, courtesy of the Senator’s political pull. The Republic President, Greg Jameson, a ruthless and canny politician, wants someone along to make sure Valerie doesn’t turn into a martyr for the cause of the Economic Justice Association so he wants her protected, and that’s where McKay’s team comes in. There’s immediate friction between the pacifistic Valerie and McKay, and between him and her enigmatic bodyguard, Nathan Tanaka. But the tension eases when McKay and Tanaka work together to save her from a terrorist attack during her visit to the Aphrodite colony. Then the unthinkable happens: the Aphrodite colony is invaded by an unknown enemy, armored humanoids that come down in stealth landing pods on huge parachutes and come out shooting. When they see one of the Invaders without its helmet, they find that it’s humanoid…but not human. The enemy they’ve been preparing for has finally shown itself. That’s all the summary I can give without spoiling things. If you haven’t read the series, I hope this is enough to catch your interest!